Although many thought that the image was captured with either a Nikon DSLR or a Sony A7-series mirrorless camera, you can see that it was certainly not the case – I captured it with the Canon 5DS R. Lens and focal length info was also quite a bit off, with a lot of readers thinking that I used a super wide angle lens at 14mm focal length or so – I used the 24-70mm f/2.8L II USM at the widest focal length of 24mm. You would be surprised to see how wide 24mm really looks, particularly in a vertical image like this. A number of our readers, particularly well-versed in astrophotography, were pretty close in guessing the exposure – as you can see, the image was shot wide open at f/2.8, ISO 3200. Although I was not specifically aiming to stay within the “500 rule”, I ended up with a 20 second exposure, which worked out pretty well. If you don’t know what the 500 rule is, it is fairly simple: you divide the number 500 by the focal length you are shooting at to yield the longest shutter speed you should use before stars become star trails. So in the above case when I was shooting at 24mm, the longest shutter speed / exposure time I should have used was roughly 20 seconds, which is pretty much what I ended up doing. Anything longer than 20 seconds would have resulted in more noticeable star trails. The next big question is the moon and that’s where most people got it wrong. 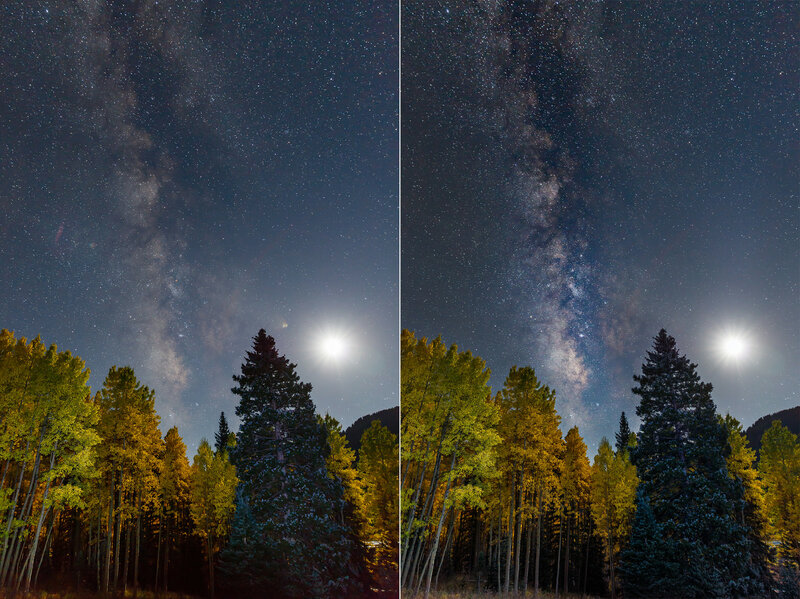 A lot of readers thought the shot was a composite image, saying that it would be impossible to yield a single exposure with both the moon and the Milky Way in the same shot. Certainly not the case – it is a single exposure! I don’t blame them, as that’s what I used to think as well. Turns out that it all depends on the moon phase. If the moon is full, it is often too bright to make anything visible in the sky, let alone capture it. But if one looked at the time I posted the article and the clue I left there, saying that I captured it “a couple of days ago”, they would have found out that the moon could not have been possibly full in mid-September. And if one previously photographed bright objects appearing in the frame, they would know that the smaller the light source, the higher is the chance to get a nice-looking “burst” in the image. In some cases, it even works when using wide apertures! The final image would not reveal the size or shape of the bright light source – it would appear just as a blob. That’s what happened in this shot. I photographed the moon wide open at f/2.8 and since the moon was relatively small both in terms of its relative size in the frame for the focal length of 24mm and in terms of the smaller area of the light side of the moon, it appeared as a bright source of light photographed at a small aperture like f/16. But can you imagine trying to capture a night scene like this at f/16? I was at f/2.8, only wishing that I had something faster with me for the Canon 5DS R! Four stops is a huge number – that’s ISO 3,200 vs ISO 51,200 – impossible to handle in terms of noise for practically any modern digital camera. It would have looked bad even resized to a much smaller version! As you can see, the original RAW file looked pretty good already. I did make a few changes in Lightroom before taking the file into Photoshop, but most of those settings were not trivial. Highlights were reduced by -40, shadow recovery pushed to +75 and a bit of clarity was added for the “pop”. Now you can probably tell that this image was not just a random shot at night – it was certainly planned. Having gone out without much luck the previous night, some of the guys from our team really wanted to get back with some nice images of the Milky Way the next day. So we used a couple of apps like Star Walk and The Photographer’s Ephemeris to find out where the Milky Way would show up from and where the moon would be in the sky. The idea was to combine the fall colors with the beautiful night sky, so after we settled on a nice area, the next step was to find a good “V” spot where we could place the Milky Way. Kudos to Spencer Cox for finding a nice spot, because that’s where we ended up setting up our tripods. From there, it was a matter of capturing a shot before it got too dark as a potential foreground replacement, and leaving the tripods in place without touching them, until it got really dark. I ended up not using the full image above, because it looked pretty flat, since the light was all over the place. 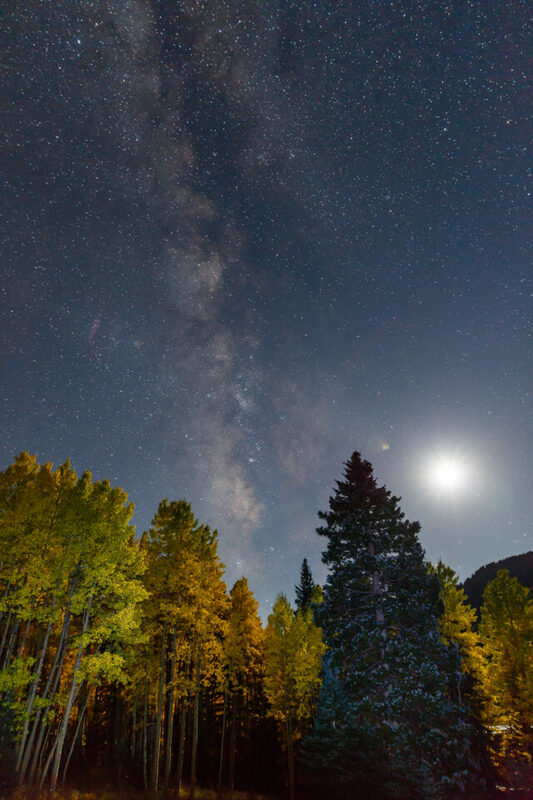 Instead, I chose to primarily use the original light-painted foreground, as it had two light sources – rim light from the moon on the top of the branches, and the primary light from the flashlight I was using to illuminate the trees. As you can see, the result is a bit nicer in comparison. The foreground looked more complete and brighter too, which is what I was trying to achieve. Hope this was useful. We will post more content like this for our readers to learn from soon! Looking forward to more “how this photograph was taken” articles, hopefully from other team members at PL. Wow. Very interesting and impressive result. This is art made with present technology – digital times, digital art works. This is great! Thank you for sharing. Suggestion: Produce new post AND solution at once, leave solution deactivated until needed, so it only needs to be enabled to show. Any assistant can do this then when the time has come. I thought it interesting how he summarized the guesses from the community. This would have not been possible if he used your approach. This was a very informative article. Can’t wait for the next one. These are interesting i can’t wait for the next one that you post. It is very interesting to see how close yet far away some people were, myself included. I like the shot, and the innovative way of presenting it to your readers. Photo discussion lists seem to be full of loud arguments over gear, personalities, etc. This was a most refreshing and stimulating read. So in the above case when I was shooting at 24mm, the maximum shutter speed I should have used was roughly 20 seconds, which is pretty much what I ended up doing. Anything longer than 20 seconds would have resulted in more noticeable star trails. Isn’t the ”Maximum shutter speed ” should be replaced by the “Minimum shutter speed” ? because for instance 1/15 sec is faster than 1/20 sec. Luc, “maximum” refers to the amount of exposure time, not the capabilities of the camera. He didn’t say the “fastest” shutter speed. Maximum means “the highest amount possible”, so if the maximum shutter speed (highest amount of exposure possible) required to not have star trails is 20 seconds, anything more than 20 seconds will give star trails. Not to be too nitpicky with such an excellent article, but I think the correct term would be “maximum exposure time.” As Luc points out, a maximum shutter speed would yield a minimum exposure time. Aaron, I changed the wording to make it less confusing. When you are above one second a larger number gives a longer exposure. When you are below one second a larger number in the denominator gives a shorter exposure. Therefore it is risky to refer to the “size of the number” to describe exposure time, as many people use the denominator alone as “the number”. Maximum shutter speed is not the highest amount (=longest) of exposure available. Maximum shutter speed means the shortest possible exposure. Because of the number reversal around 1 second it becomes extra important to be exact in your language. You show the daylight exposure and mention: “So I had to resort to adding a couple of noise-free areas from the earlier shot, which was taken before it got pretty dark”. Doesn’t that make it a compound shot or even a poor man’s HDR. It’s certainly not a “single exposure” any more. Agreed on the terminology, so I changed it to “longest shutter speed / exposure time”. As for the new question, it is not an HDR – I would say a blending technique to copy the outer edges of the frame that were noisy to yield a more pleasing image. I could have gotten away with a single exposure and it looked pretty good, but the noise of the Canon was the issue, which is why the final result is a composite. A composite should not be called a single exposure, Because it is not. Bengt, perhaps you need to re-read the article. I clearly pointed out that the moon and the sky was a single exposure – it was to explain to those who thought that the moon was copy pasted from another shot. 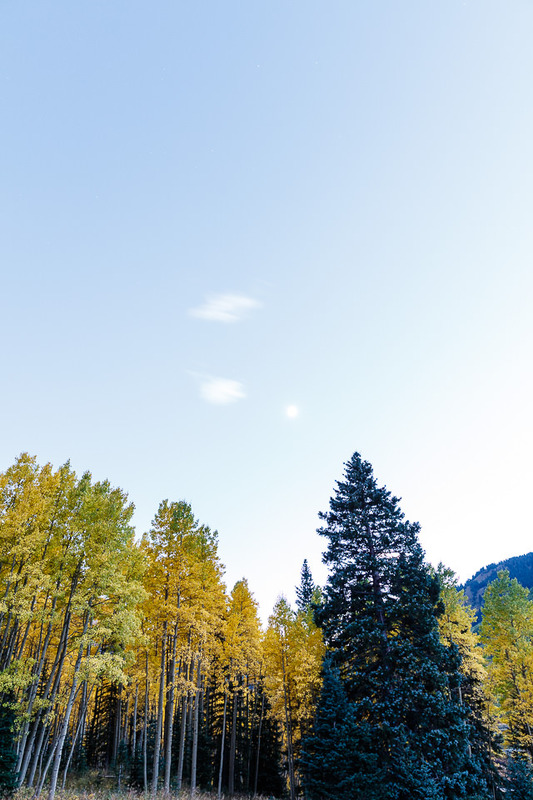 I specifically mentioned the fact that I combined another image further below just to reduce the noise in the tree line. Nowhere do I say that the last final image is a single exposure. The answer to your challenge is NOT a single exposure. Don’t even mention the word in the article and change it to something else later. We have other things to do than re-reading your thoughts. You need to get used to critical readers, even if I can see that you prefer praise. Agreed on the use of the terminology – it can sound confusing. I changed it to “longest shutter speed / exposure time”. Great article! What kind of flashlight did you use, was it an LED or halogen bulb? I was miles off for sure about the high aperture. I dont really do much of this type of photography (obviously) and I was thinking this was a full moon. Great explanation about why it turned out that way. Now I will try this – try to learn a new trick for this old dog. Great exercise, can’t wait for the next one. This is a much appreciated delivery of how it’s done, thank you! Thanks for the info Nasim, this was my guess as I do alot of night/star photography and leaveing the tirpod and coming back later is the key to this photo. Thanks everyone for the very good comments and guesses. As an advice for future “how was this picture taken” posts, I’d limit it to unedited pictures or change the topic to something like “how was this picture created”. The problem with merged images is that the possibilities to manipulate pictures are limitless. And with limitless comes a degree of millions of possibilities in how one could achieve a very similar look or photo. Without proper full resolution pictures, it’s practically impossible to make any informative guess – it becomes a matter of luck. I think most of us who browse this blog are well versed in photography and how one can manipulate the outcome with exposure, aperture and focal-length, but not necessarily the art of manipulating photos with Lightroom, Photoshop or other graphic-programs. IMO keeping it simple would be a lot better and fairer too. What a combination of techniques, timing, and foresight ! more than that , is the sharing of such insights .. I very much appreciate this photo and the explanation of how it was created. I’ve done some slightly similar imaging but nothing this sophisticated. Thank you for an inspiring image and the data on how you made it come to life. This capture made me study the Milky Way and moon movement more. So with the PhotoPills app and the personal planetarium SkySafari app I leaned the moon rises about a negative 55 min very day and the full moon rises opposite the setting sun and the new moon with the rising sun, but most everyone knows that. But that moon with the last sliver of light rising with the Milky Way just before sunrise, I had no idea how great it looks. So during the winter I studied and marked the dates and then watched the weather. This is what dreams YOUR inspirational shot produced. Thank You for such great articles. One other thing with the great advances in cameras dark skies are really no problem anymore. LR and Nik Color Efex Pro for contrasting only. No PS layering (do not own PS). This taken on Feb 5th 2016 three days before the new moon had a little too much foreground on a very cold 25 degree morning 30 mph winds and a storm rolling out to sea that I did not see on my drive to the beach site all I saw was clear sky and stars on my way there. This is my last capture because the red glow of pending sunrise was starting to show. With a 14mm I should have been closer to the pier, with 12mm or 14mm lenses get as close to your foreground subjects as you can! Thanks Again and Thanks for those sticky sensor cleaners, This is a great site to learn and be inspired from!!!! This is an awesome photo! Your explanation makes sense, but I am wondering what you do to get the focusing right. I love to photograph the night sky any time I can get away from the city, but the hardest part is adjusting the focus to where both the foreground and stars are reasonably sharp (especially with a lens that goes down to f/1.8). Do you have any advice for this? There is a concept of HYPER FOCAL distance in lens physics. For a given combination of aperture and sensor size, there is a range of distance between which the image is sharp. This distance can be read off form charts available on the net. For very big apertures ( like your query of f/1.8) this distance is very short, meaning , you cant get both near and far areas in focus. I have used this for night photography, wherein focusing itself is an issue. During treks, I read off the minimum distance from the chart, place a light torch a little away, get it auto focused (& change to manual focus) or focus manually. I may have been too brief, you may have to read from the net. When you go out a few days before the new moon there is always that crescent moon following the Milky Way, the moon rises about 55 minutes later every day (look at the SkySafari app to view day after day). Instead of using manual mode use aperture mode and just keep the histogram right edge a little right of center or until you see the smiling cat (dark horse nebula) using ISO and using AWB you will see the different colors faintly. Getting a bright shot in LR just decrease highlights, whites and increase shadows, blacks and clarity, vibrance and saturation. Under tone curve play with highlights/lights/shadows/blacks in medium contrast And LAST adjust exposure . And for a deep looking spiral a big draken brush but play with all like temp to bring out better color, contrast so it does not look too clear (leave a little milky). It is fun to go out before the new moon to get that Milky Way, moon and twilight venus girdle on the horizon. Voigtlander 12mm f/5.6 the way it should look. All done in Lr and Nik Color Efex Pro only, No PS layering adding nothing just what was there in one shot no HDR! And lightroom now has the Lens corrections for the Samyang/Bower/Rokinon lenses from the APS-C 8mm fisheye to the Full Frame 12mm fisheye as well as the most used 14mm f/2.8 full frame to get that straight horizon. All done on the Sony A7s. Use PhotoPills app to know when and where to capture the Milky Way. How were you able to get so much milky way with that much light from the moon? So basically you took one day photo and one night photo and used the day photo for reducing noise?